Home/Archive by Category "Intuitive Investigations Academy"
Jennifer Shaffer is a world-renowned Psychic Medium. Her cases have been profiled on 20/20, Buzzfeed, Dr. Phil, and Oxygen. Jennifer donates her time to law enforcement and families of victims, by assisting with criminal cases and helping find answers. She is the Co- Founder, VP & Law Enforcement Case Expert for Impartial Witness, a strategic artificial intelligence software platform designing partnerships between law enforcement and the intuitive network. Jennifer founded the JS Intuitive Investigations Academy and also teaches an intuitive investigations development course for various skill levels. She is the subject of two bestselling books by Richard Martini “Backstage Pass to the Flipside.”Learn more about Jennifer here. Tomorrow, Sunday March 24th, Jennifer just opened up three more appointments! Jennifer just opened up three spots for tomorrow, Sunday March 24th. First come first serve – otherwise the next available appointment is April 9th. Not only is this another sold out event, there are ten people on the list already for May 13th. Wine and Spirit events are a very fun way to start understanding the other side. I’ve been working with Jennifer for three years now. We get together often, and I film her chatting with friends of mine no longer on the planet. (“Backstage Pass to the Flipside; Talking to the Afterlife with Jennifer Shaffer.” I know how spot on she can be, and in our two books (and “Hacking the Afterlife”) I include some of the more amazing times she’s reported “new information” about someone on the flipside that I did not know, could not have known, but later it turns out to be forensically accurate. I also happen to know some of the cases she’s worked on, including with the former head of the LAPD, where she was able to solve missing person cases. She does that work pro bono – helping parents who’ve lost a child and are trying to track them down. I’m also aware of the architecture of the flipside, and why sometimes mediums don’t get the answers accurately (there may be more at stake) or why they misinterpret the image that they see. I was with her last thursday, when a waitress stopped by the table to thank her for doing a reading, and wanted to say “You remember when you told me that I was moving to Colorado?” Jennifer shrugged as she doesn’t remember anything during her sessions (and why I film them) and the waitress said “I told you that I’ve never been, and that I wasn’t going, but my boyfriend just called to say that he accepted a job there, and we’re moving there in a few weeks. So thank you.” Sometimes what she says about someone turns out to be accurate later on. Either way, this kind of “exploration” into the idea that “life goes on” is not for everyone, nor should it be. Not everyone “signs up to learn how the play ends.” We are here for a reason, and some of us need to be fully invested in that reason. However, in the case of Jennifer, I can report that we’ve been at this together for three years now, and the times when she’s been accurate with friends or acquaintances who’ve checked out, but she reports details that only their families or close associates would know, or that we learn “new information” is kind of astounding. For example, when my friend Harry Dean Stanton died, he showed up in our meeting and told me the circumstances of his passing, who was in the room with him at the time, and what he wanted to tell his friends at the memorial service. I told him I’d pass his messages along, and they were spot on – with details only his close associates would know (that I did not know until I went to the memorial service a week later and heard all the confirmations of detail – who was with him when he died, and me telling his friends his private messages to them about their health and journey.) I asked Harry Dean if he had any message he wanted me to pass along, and it was “tell people to believe in the possibility of the afterlife, then they won’t waste their time like I did arguing about it.” (Which he did, often.) Jennifer is the real deal, and I have it on film to prove it. I am so looking forward to teaching this Intuitive Investigations Development Course at the The Healing Collective. 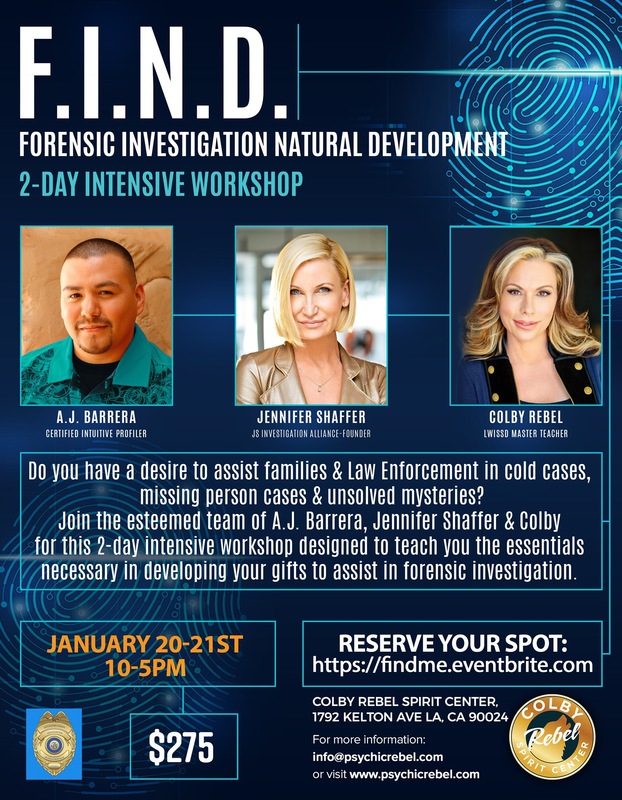 Come join me for the weekend and discover how to utilize your intuition in your every day life as well as contributing in assisting on live and cold cases. You will hear from the FBI about how we work with them and what they look for as well as from a victims family that we have collectively helped through Impartial Witness. This work does not end when the course ends. You will have the opportunity to take it much further. Come see why Impartial Witness is changing the future of investigations. Calling Out with Forensic Mediums for missing person, Mollie Tibetts, a 20 year old student in Iowa who went missing on July 18 and into July 19. We need you to report anything that resonates. Authorities ask that anyone with information about Tibbetts contact the Poweshiek County Sheriff’s Office at 641-623-5679 or email to tips@poweshiekcosheriff.com. Tipsters can also go to CrimeStoppersOfCentralIowa.com. We are looking for clues with Forensic Psychic Medium Jennifer Medlyn Shaffer. She is joined by two respected clairvoyant mediums, Rebecca Fearing, and Calise Simone. Also on the line, Toni Ingram, Executive Case Manager for Jennifer’s cases at the JS Intuitive Investigations Academy and at FOHVAMP – Families Of Homicide Victims And Missing Persons. They are presently working side by side and developing an Impartial Witness APP. Their website is: http://www.unresolvedhomicides.org. Authorities ask that anyone with information about Tibbetts contact the Poweshiek County Sheriff’s Office at 641-623-5679 or email to tips@poweshiekcosheriff.com. Tipsters can also go to CrimeStoppersOfCentralIowa.com. Go to Website: www.crimestoppersofcentraliowa.com, or call 800-452-1111 or 515-223-1400 to leave an anonymous tip.